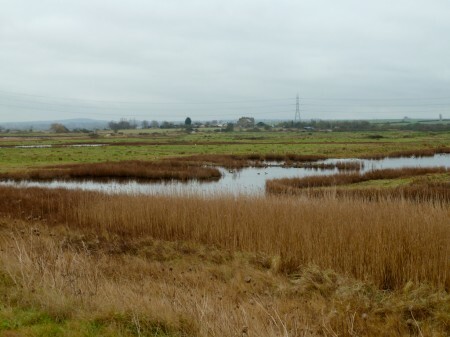 After the rain of the previous day, we decided to try Oare this week where there are some hides if we needed cover. As it turned out the weather gradually improved and we had a great time. At the jetty area we stopped to enjoy redshank, black-tailed godwit, dunlin, grey plover and common gull – the latter enjoying a view from the top of the poles lining the jetty. We decided to walk west along the seawall, there were teal, mallard and coot in the pools and greylag on the fields grazing alongside Konik ponies. On one of the old defence buildings stock doves perched and a rather confused green woodpecker attached itself to the corner of the bulding – I’m sure the brickwork would prove a little hard on the bill – presumably it was checking for food in the crevices in the mortar. A female marsh harrier was spotted over Harty and as we scanned for a reported rough-legged buzzard two large white birds landed in a field on the far side of the river. Under Malcolm’s instruction we checked they were not mute swan – he was right, they were spoonbill! On the return to the car park we added cormorant, wood pigeon, tufted duck and wigeon. A flock of greenfinch landed in a bramble bush and as we counted them found a stonechat had joined them. Skylark, meadow pipit and kestrel added into the mix. We returned to the car park to collect lunch which we wanted to have in the hide at the mouth of the creek. As we walked along the eastern sea wall we heard at least two, possibly three, cetti’s warblers. Over the Isle of Sheppey huge flocks of brent and greylag geese were flying in long skeins as their feeding grounds were covered by the incoming tide. The tide continued to push dunlin and black-tailed godwit onto the East Flood. A turnstone was picking over the seaweed at the high tide line. Bobbing about on the high tide were at least a dozen great-crested grebe, shelduck, and a common seal. On the East Flood we watched large numbers of godwit and dunlin, lapwing, starling, shoveler, a ruff, a snipe, little grebe and about a dozen pintail. From the hide by the flood we scoured the scrape for some new species and after careful scrutiny I decided I may have found a little stint – bowing to superior knowledge I waited with baited breath whilst Mr Jennings delivered his verdict! Success at last, perhaps I am finally learning something about waders. Or was it just a lucky guess (I leave it to you dear reader to decide – but those who know me will applaud my luck!). More pintail were found, at least 25 in all, golden plover shared one of the islands with a few grey plover, 57 avocet and some lapwing. The godwit and dunlin were huddled closely on another island. As large numbers of waders flew up we saw a peregrine hurtling towards us. We had continued to scan Harty and the Isle of Sheppey all day, and our patience was finally rewarded, a couple of female marsh harriers, kestrels, pheasants, and finally a large bird with white on the rump. With the distance and the grey hazy light, even with the telescope it was hard to tell whether it was a ring-tail or a rough-legged buzzard. We could have talked ourselves into either. In any event we enjoyed the sighting, and our knowledge of these two species is increased every time we get the field guide out and debate the issue. 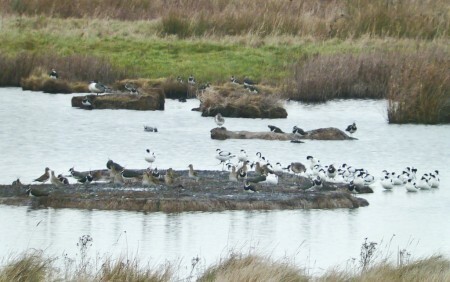 We moved off to the hide behind the West Flood in the hope of better views, but it was not to be. The greenfinch flock gave us another great viewing, but by now the light was fading and it was time to go home.